Around 1860 in a quaint farmhouse just below the Dublin Mountains in Ireland, a future poet was born. This young woman spent her life growing up far from city life and out in nature with her family. She spent large amounts of time sneaking books and papers into her small hiding spot, a small loft in the stables at her home, and taking in any amount of reading she could find. Although she knew her love of reading was forbidden not only by her mother, but by her society, she strived to learn more and read more. Even though “She was a child slow to learn at school, but engrossed in learning after her own fashion.” ("Katharine tynan ©," 2013). This child grew to be a brilliant woman. Katharine Tynan expressed her world through poetry and challenged the world to accept women authors and artists. She not only used her creativity to produce art, but she also used her creative mind to help others. Katharine Tynan lived in Ireland during a time women were expected to stay home and raise the kids. Katherine’s father, mother, and sister understood the roles of young women in the 1860’s; but Katharine was far too intrigued by learning and reading as much as one could be and was the black-sheep in her family. Women in Ireland had not received many rights to help their ways of living and equality. In 1864 one of three laws that Parliament passed regarding women was the “compulsory inspection of prostitutes for venereal diseases in certain military camps in England and Ireland” (citation 2). These laws were passed due to the overwhelming amount of soldiers with sickness caused by STDs and STIs that could not fight as well. The women of Ireland and England were outraged by these acts being passed and taking the right of privacy to certain women. Women and men from both cultures came together and fought for the acts to be repealed. The acts were finally repealed with the help of Ireland’s Ladies’ National Association for the Repeal of the Contagious Diseases Act and Josephine Butler (Luddy 1995). Women gathering together to help with a political battle was not an odd occurrence in Ireland society. In the politics of Ireland women held a lot of input and support for ideas. Irish women were not given the right to vote until 1918, but many women helped out causes by being a part of riots and movements across the nation. Women were involved in the discussion of politics and some even tried to influence the men in their homes to vote in certain ways. Women of higher status were often given the chance to debate and discuss politics with their fathers, brothers, and spouses; most of which held higher positions and had influences in politics and society. Majority of situations women were encouraged to voice their opinion in the political field, but unfortunately their opinions never made it to the voting booths in Ireland (Luddy, 1995). Katharine had a marvelous kick-start to her career that never seemed to slow down. She had her first official piece appear in a newspaper called “Irish Monthly” when Tynan was just seventeen years old. Although Katharine’s education was over by the time she was fourteen, she still strived to achieve greatness in writing. She had published her first book, Louise de la Vallier e and Other Poems, in London 1886. While reading the newspaper, Katharine came across a one-act play called Mosada in 1887. She wrote a review to the place of its origin which turned out to be the author by the name of W. B. Yeats who attended Dublin University. From that moment on Katharine’s career was in high gear. She did not only become life-long friends with Yeats, but she also had numerous works appear in the Dublin University Review. Katharine wrote many pieces including twelve collections of short stories and over one hundred novels. Her friendship with Yeats was often question due to how close they were. Yeats had asked for Katharine to marry him but she quickly refused. She never wanted people to assume her success was because of her relationship with such a great and powerful writer like Yeats. A lot of Katharine’s pieces can be found all over the world. Some of her books and pieces are held at universities all over the nation such as; Princeton, NYU, Harvard, and Salem College also owns a few copies of some of her books. Katharine painted pictures and stories with her words and point of view. She grew up in a Catholic home and lived her life in such a manner as well. She would often incorporate religion in her writing in multiple literary techniques and styles. “The sheep with their little lambs/ Pass'd me by on the road;/ All in an April evenin/ I thought on the Lamb of God.” (Tynan, 1900). This is an excerpt from Katharine’s piece Sheep and Lambs which has heavy usage of biblical ideas and references. Katharine also embraced her Irish heritage and often wrote exclusively Irish pieces. Her second volume of poetry, appropriately titled Shamrocks, was strictly limited to the Irish heritage and way of life. Katharine brought the woman writer and artist to not only the Irish, but also to the English. 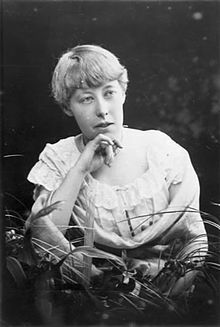 She moved to England with her husband in 1893 and managed to bring light on women and their equality in writing. Katharine not only impacted the Ireland and England, but she helped pave the way form women’s rights all over the globe. She wrote a piece called Any Woman that compares women to houses. It talks about all aspects of the house and how women are the protection, foundation, and decoration of households (Tynan 1886) She takes the ideals of women during her time and makes them almost seem positive, but the poem obviously has hints of the undermining ideals of society. She was not only creative in her words but how she used them to better her culture and world. Katharine was also a member of many Women’s Suffrage Societies until 1918 when Irish women had achieve the right to vote. Katharine Tynan did not just express creativity through writing, and she also was not just a creative writer either. Katharine dabbled in sketching, play writing, and children’s books throughout her life time. Many of her extra pieces were not only entertaining, but they were also a great source of learning about many topics. Katharine wrote children’s stories on religion, moral values, the Irish culture, and other places in the world. She also wrote many biographies, editorial work, and journalism on popular political topics. One of the most controversial topics she wrote about, other than women’s suffrage, was the working conditions of women in industries and major companies. Katharine was well educated and had a voice that no one could ever seem to ignore. She traveled often from her home in Ireland to England for many years until she finally settled in England with the family of her own. She was a fierce writer and brilliant woman for her time. Her impact on her culture and the world is still prominent today and continues to fascinate scholars and students all around the world. Katharine changed the way a culture saw women. She opened up the writing industry for women and also helped give women the right to vote, better working conditions, and the ability to live on their own if they wish to do so (Luddy 1995). On April 2nd, 1931 Katharine Tynan passed away at her home due to a cerebral thrombosis, or better known as a blood clot in her brain. (n.d.). Katharine tynan © orlando project. (2013). Luddy, M. (1995). Women in Ireand, 1800-1918 A Documentary History. Cork, Ireland: Cork Universty Press University College. (3 ed., Vol. 4, pp. 58-69). Tynan, K. (1886). Louise de la valliere: and other poems. (2nd ed.). London, England: Kegan Pual, Trench and Company.